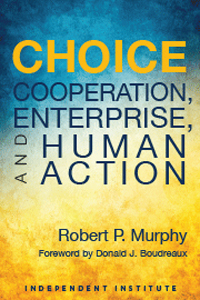 Robert P. Murphy demonstrates that modern civilization itself rests on the market economy. Yet the market can function properly only if the government respects the institution of private property. Unlike what usually passes for economics in many classrooms, government, the media and elsewhere, Choice is an engaging and intriguing book that provides something quite unique: a genuine treatise on economics that instructs and entertains both economists and general readers. Drawing on the seminal volume by the “Austrian School” economist Ludwig von Mises, Human Action, and comparing classical and neoclassical approaches, Choice is a creative, comprehensive, and unusually lucid book on economic science and market processes. The book illuminates free economies as underpinning civilization, the folly of government central planning, the primacy of entrepreneurship and innovation, the nature of money and banking, the causes of the business cycle, the failures of government intervention, and more. As a result, Choice teaches economic principles and exposes economic fallacies, and any reader will learn both the important truths about economics and the crucial value of individual choice, entrepreneurship, and free markets.